One of Germany's earliest uses of chemical weapons occurred on October 27, 1914 when shells containing the irritant dianisidine chlorosulfonate were fired at British troops near Neuve-Chapelle, France. Germany used another irritant, xylyl bromide, in artillery shells that were fired in January 1915 at the Russians near Bolimów, in present-day Poland. 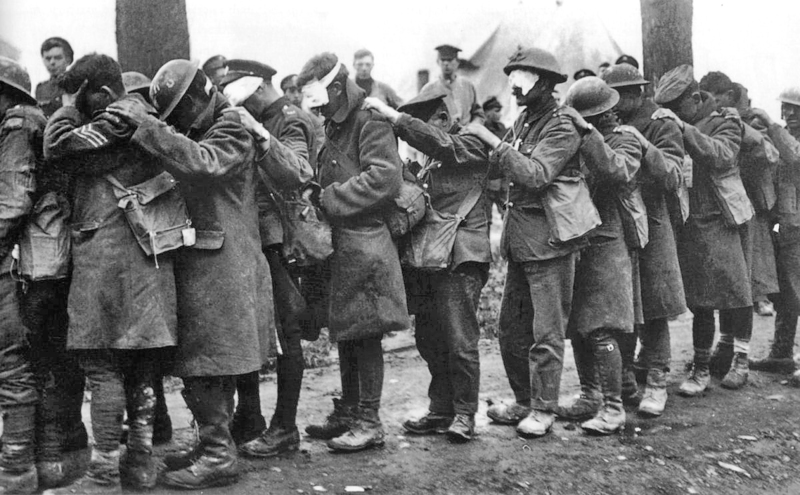 The first full-scale deployment of deadly chemical warfare agents during World War I was at the Second Battle of Ypres, on April 22, 1915, when the Germans attacked French, Canadian and Algerian troops with chlorine gas. Deaths were light, though casualties relatively heavy. The Western allies did not use chemical weapons during the Second World War. The British planned to use mustard gas and phosgene to help repel a German invasion in 1940-1941, and had there been an invasion may have also deployed it against German cities. General Brooke, in command of British anti-invasion preparations during World War II said that he "...had every intention of using sprayed mustard gas on the beaches" in an annotation in his diary. The British manufactured mustard, chlorine, lewisite, phosgene and Paris Green and stored them at airfields and depots for use on the beaches. The mustard gas stockpile was enlarged in 1942-1943 for possible use by Bomber Command against German cities, and in 1944 for possible retaliatory use if German forces used chemical weapons against the D-Day landings. Winston Churchill issued a memorandum advocating a chemical strike on German cities using poison gas and possibly anthrax. Although the idea was rejected, it has provoked debate. In July 1944, fearing that rocket attacks on London would get even worse, and saying he would only use chemical weapons if it were "life or death for us" or would "shorten the war by a year", Churchill wrote a secret memorandum asking his military chiefs to "think very seriously over this question of using poison gas." He said "it is absurd to consider morality on this topic when everybody used it in the last war without a word of complaint..."
States parties to the Chemical Weapons Convention. Light colored territories are those states parties that have declared stockpiles of chemical weapons and/or have known production facilities for chemical weapons. ↑ "Convention on the Prohibition of the Development, Production, Stockpiling and Use of Chemical Weapons and on Their Destruction (CWC): Annexes and Original Signatories". Bureau of Arms Control, Verification and Compliance. http://www.state.gov/t/avc/trty/175492.htm. Retrieved 19 January 2012. ↑ Michael Bothe; Natalino Ronzitti; Allan Rosas, eds (1998). "The New Chemical Weapons Convention - Implementation and Prospects". 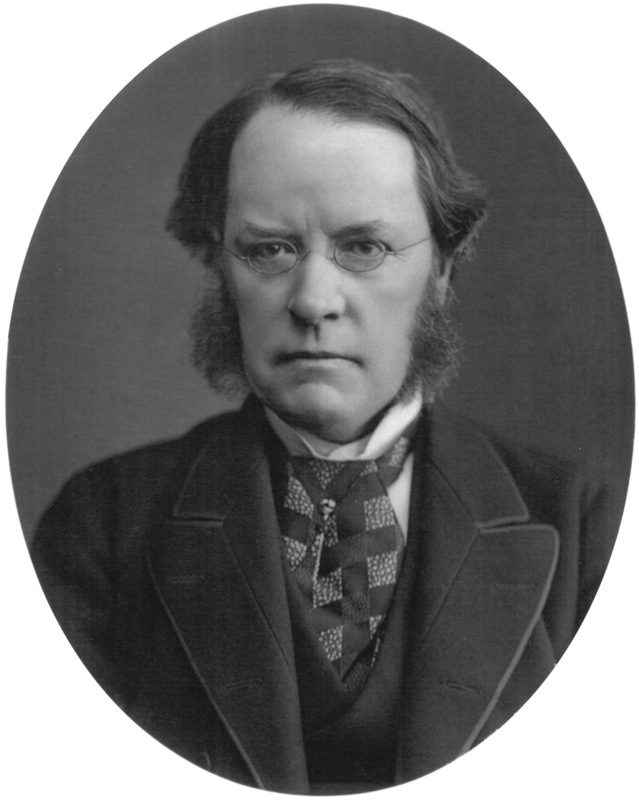 Martinus Nijhoff Publishers. p. 17. ISBN 90-411-1099-2. ↑ 5.0 5.1 Richardt, Andre (2013). "CBRN Protection: Managing the Threat of Chemical, Biological, Radioactive and Nuclear Weapons". Germany: Wiley-VCH Verlag & Co.. p. 4. ISBN 978-3-527-32413-2. ↑ Charles C. Mann (2011). "1493: Uncovering the New World Columbus Created". Random House Digital. p. 9. ISBN 978-0-307-59672-7. https://books.google.com/books?id=IqaMEWNvsJQC&printsec=frontcover#v=onepage&q&f=false. ↑ Eric Croddy (2002). Chemical and Biological Warfare: A Comprehensive Survey for the Concerned Citizen. Springer. p. 131. https://books.google.com/books?id=MQMGhInCvlgC. ↑ Smart, Jeffery K. "CHEMICAL AND BIOLOGICAL WARFARE RESEARCH AND DEVELOPMENT DURING THE CIVIL WAR". US Army Soldier and Biological Chemical Command. http://www.wood.army.mil/ccmuseum/ccmuseum/library/Civil_War_CBW.pdf. Retrieved 7 November 2014. ↑ Schmaltz, Florian (2005). "Kampfstoff-Forschung im Nationalsozialismus Zur Kooperation von Kaiser-Wilhelm-Instituten, Militär und Industrie". Wallstein Verlag. ↑ Schmaltz, Florian (2006). "Neurosciences and Research on Chemical Weapons of Mass Destruction in Nazi Germany". pp. 186–209. Digital object identifier:10.1080/09647040600658229. PMID 16887760. ↑ "Chemical warfare". World War II. DesertWar.net. http://desertwar.net/chemical-warfare.html. ↑ "Laws of War: Declaration on the Use of Projectiles the Object of Which is the Diffusion of Asphyxiating or Deleterious Gases; July 29, 1899". Avalon.law.yale.edu. http://avalon.law.yale.edu/19th_century/dec99-02.asp. Retrieved 2014-01-18. ↑ "Convention (IV) respecting the Laws and Customs of War on Land and its annex: Regulations concerning the Laws and Customs of War on Land. The Hague, 18 October 1907.". International Committee of the Red Cross. http://www.icrc.org/ihl/385ec082b509e76c41256739003e636d/1d1726425f6955aec125641e0038bfd6?OpenDocument. Retrieved 2014-01-18. ↑ 27.0 27.1 Army History Unit. "Chemical Warfare in Australia (2nd Edn) 2013 (Army Military History Series)". http://www.bookdepository.co.uk/Chemical-Warfare-Australia-Geoff-Plunkett/9780987427908. ↑ Geoff Plunkett. "Death By Mustard Gas". http://www.bigskypublishing.com.au/Books/Military/Death-by-Mustard-Gas/1067/productview.aspx. ↑ Fisk, Robert (December 30, 2000). "Poison gas from Germany". http://www.zmag.org/hussein.htm. ↑ 32.0 32.1 Гречко, p. 468. ↑ 33.0 33.1 Bellamy, Christopher (4 June 1996). "Sixty secret mustard gas sites uncovered". The Independent. http://www.independent.co.uk/news/sixty-secret-mustard-gas-sites-uncovered-1335343.html. ↑ "Chemical Warfare -Suffolk". Anti-Invasion defences Suffolk World War II. http://pillboxes-suffolk.webeden.co.uk/#/chemical-warfare/4543908803. Retrieved 18 June 2008. ↑ 35.0 35.1 Pears, Brian. "Chapter 5 Invasion". Rowlands Gill and the North-East 1939 - 1945. http://www.bpears.org.uk/Misc/War_NE/w_section_05.html. ↑ Paxman, Jeremy; Harris, Robert (2002-08-06) . "The War That Never Was". A higher form of killing: the secret history of chemical and biological warfare. p. 128. ISBN 978-0-8129-6653-4. OCLC 268949025. http://libcom.org/library/churchills-plans-drench-germany-poison-gas-anthrax-robert-harris-jeremy-paxman. "I want the matter studied in cold blood by sensible people"
↑ US Naval Historical Center. "Naval Armed Guard Service: Tragedy at Bari, Italy on 2 December 1943". http://www.history.navy.mil/faqs/faq104-4.htm. ↑ Niderost, Eric. "World War II: German Raid on Bari" (Full text). HistoryNet.com. http://www.historynet.com/world-war-ii-german-raid-on-bari.htm. ↑ Infield, Glenn B. Infield. "Disaster at Bari". ↑ Reminick, Gerald. "Nightmare in Bari: The World War II Liberty Ship Poison Gas Disaster and Coverup". ↑ Ghosh, R.; Newman, J.E. (Jan 29, 1955). "A new group of organophosphorus pesticides". p. 118. ↑ Robert Bud, Philip Gummett (2002). Cold War, Hot Science: Applied Research in Britain's Defence Laboratories, 1945-1990. Science museum. https://books.google.com/books?id=HMx_6FtHBcUC. ↑ "Nancekuke Remediation Project". Ministry of Defence (Archived by The National Archives). http://webarchive.nationalarchives.gov.uk/+/http://www.mod.uk:80/DefenceInternet/AboutDefence/WhatWeDo/DefenceEstateandEnvironment/Nancekuke/. Retrieved 25 April 2012. ↑ Staff, Committee on Veterans' Affairs, US Senate (December 8, 1994). "Is Military Research Hazardous to Veterans' Health? Lessons spanning half a century". 103d Congress, 2d Session - Committee Print - S. Prt. 103-97. http://www.gulfweb.org/bigdoc/rockrep.cfm. ↑ 51.0 51.1 Philip Huang (October 17, 2002). "Sickening strategy". Archived from the original on August 7, 2014. https://web.archive.org/20140807173745/http://www.dailyemerald.com/2.2378/sickening-strategy-1.222877. ↑ Fedorov, Lev (27 July 1994). "Chemical Weapons in Russia: History, Ecology, Politics". Center of Ecological Policy of Russia. https://fas.org/nuke/guide/russia/cbw/jptac008_l94001.htm. ↑ Birstein, Vadim J. (2004). "The Perversion Of Knowledge: The True Story of Soviet Science". Westview Press. ISBN 0-8133-4280-5. ↑ Federov, Lev; Mirzayanov, Vil (1992). "A Poisoned Policy". ↑ Lafayette, Lev (July 26, 2002). "Who armed Saddam?". http://www.hartford-hwp.com/archives/51/040.html. ↑ Fassihi, Farnaz (October 27, 2002). "In Iran, grim reminders of Saddam's arsenal". http://www.nj.com/specialprojects/index.ssf?/specialprojects/mideaststories/me1209.html. ↑ Paul Hughes (January 21, 2003). "It's like a knife stabbing into me". The Star (South Africa). http://www.thestar.co.za/index.php?fArticleId=39470. ↑ Sciolino, Elaine (February 13, 2003). "Iraq Chemical Arms Condemned, but West Once Looked the Other Way". Archived from the original on May 27, 2013. https://web.archive.org/20130527105217/http://www.commondreams.org/headlines03/0213-05.htm. ↑ "Death Clouds: Saddam Hussein’s Chemical War Against the Kurds 5/1/1991". http://www.dlawer.net/?q=node/79. Retrieved 26 February 2016. ↑ 66.0 66.1 66.2 Hawk, Kathleen Dupes; Villella, Ron; Varona, Adolfo Leyva de (30 July 2014). Florida and the Mariel Boatlift of 1980: The First Twenty Days. University of Alabama Press. ISBN 978-0817318376. https://books.google.com/books?id=DWbvAwAAQBAJ&pg=PA67. Retrieved 11 October 2014. ↑ "Chemical weapons being used in Angola?". Park City Daily News. Bowling Green, Kentucky. 22 August 1986. https://news.google.com/newspapers?nid=1697&dat=19860822&id=kzQqAAAAIBAJ&sjid=ZUcEAAAAIBAJ&pg=5194,5088760&hl=en. Retrieved 28 July 2015. ↑ "Cubans using poison gas in Angola". The Lewiston Journal. Lewiston–Auburn, Maine. 26 August 1988. https://news.google.com/newspapers?nid=1899&dat=19880826&id=qmMgAAAAIBAJ&sjid=MWYFAAAAIBAJ&pg=2776,3400252&hl=en. Retrieved 28 July 2015. ↑ 70.0 70.1 Bush War: The Road to Cuito Cuanavale: Soviet Soldiers' Accounts of the Angolan War. Auckland Park: Jacana Media (Pty) Ltd. 2011. pp. 128–130. ISBN 978-1-4314-0185-7. ↑ "T Is for Terror: A mad bomber who stalked Los Angeles in the ’70s could be the poster boy for the kind of terrorist the FBI fears today". 9 July 2003. http://msnbc.msn.com/id/3070093. ↑ Nic Robertson (August 19, 2002). "Disturbing scenes of death show capability with chemical gas". CNN. Archived from the original on July 14, 2015. https://web.archive.org/20150714165458/http://archives.cnn.com/2002/US/08/19/terror.tape.chemical/. ↑ Multi-National Force Iraq, Combined Press Information Center (20 April 2007). "Chlorine Tanks Destroyed, Terrorists Killed in Raids". Press Release A070420a. Archived from the original on July 14, 2015. https://web.archive.org/20150714165853/http://www.mnf-iraq.com/index.php?option=com_content&task=view&id=11530&Itemid=128. ↑ Multi-National Force Iraq, Combined Press Information Center (6 April 2007). "Suicide Vehicle Detonates outside Police Checkpoint". Press Release 20070406-34. Archived from the original on July 14, 2015. https://web.archive.org/20150714165548/http://www.mnf-iraq.com/index.php?option=com_content&task=view&id=11185&Itemid=128. ↑ Ban, Ki-Moon (19 March 2007). "Secretary-General Condemns Chlorine Attack in Iraq". http://www.un.org/radio/6542.asp. ↑ "Text of the Biological and Toxin Weapons Convention". Brad.ac.uk. http://www.brad.ac.uk/acad/sbtwc/keytext/genprot.htm. Retrieved 2013-09-05. ↑ "UNTC". Treaties.un.org. http://treaties.un.org/Pages/ViewDetails.aspx?src=TREATY&mtdsg_no=XXVI-3&chapter=26&lang=en. Retrieved 2011-09-16. ↑ Syed, Tanya (2009-01-19). "Ancient Persians 'gassed Romans'". BBC. http://news.bbc.co.uk/1/hi/sci/tech/7837826.stm. Retrieved 2009-02-21. ↑ Irwin, Will (22 April 1915). "The Use of Poison Gas". 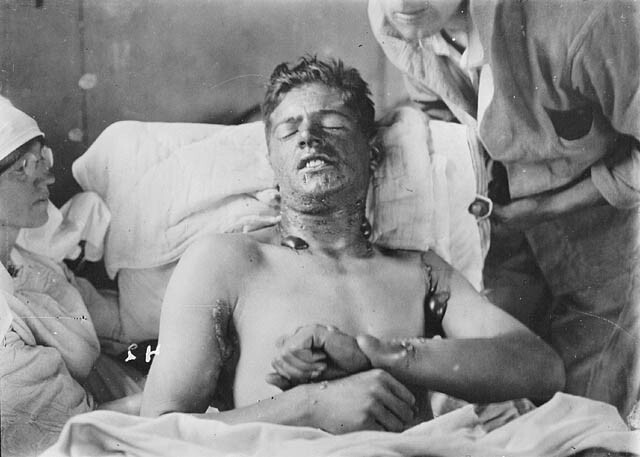 http://net.lib.byu.edu/~rdh7/wwi/1915/chlorgas.html. ↑ Johnson, Jeffrey Allan (1990). "The Kaiser's Chemists: Science and Modernization in Imperial Germany". University of North Carolina Press. ↑ Griffin Davis (May 24, 2006). "CBRNE - Chemical Detection Equipment". http://www.emedicine.com/emerg/TOPIC924.HTM. Retrieved 2007-10-22. ↑ US Department of Defense (2 June 2003). "Multiservice Tactics, Techniques, and Procedure for NBC Nuclear, Biological, and Chemical (NBC) Protection (FM 3-11.4 / MCWP 3-37.2 / NTTP 3-11.27 / AFTTP(I) 3-2.46)" (PDF). GlobalSecurity.org. FM 3-11.4. http://www.globalsecurity.org/wmd/library/policy/army/fm/3-11-4/fm3-11-4.pdf. Retrieved 2007-10-22. ↑ 87.0 87.1 Centers for Disease Control and Prevention (2002-09-12). "Protecting Building Environments from Airborne Chemical, Biologic, or Radiologic Attacks". http://www.medscape.com/viewarticle/441190. Retrieved 2007-10-22. ↑ 88.0 88.1 88.2 88.3 US Department of Defense (29 September 2000). "Multiservice Tactics, Techniques, and Procedure for NBC Defense of Theater Fixed Sites, Ports, and Airfields (FM 3-11.34/MCRP 3-37.5/NWP 3-11.23/AFTTP(I) 3-2.33)" (PDF). GlobalSecurity.org. http://www.globalsecurity.org/wmd/library/policy/army/fm/3-11-34/fixedsites.pdf. Retrieved 2007-10-22. ↑ Ciottone, Gregory R; Arnold, Jeffrey L (January 4, 2007). "CBRNE - Chemical Warfare Agents". http://www.emedicine.com/emerg/TOPIC852.HTM. Retrieved 2007-10-22. ↑ "In Surprise Testimony Cheney Renews Opposition to CWC". United States Senate. 1997-04-08. Archived from the original on December 17, 2008. https://web.archive.org/20081217171905/https://fas.org/cw/cwc_archive/cheneyletter_4-8-97.pdf. Retrieved 2009-01-04. ↑ "India declares its stock of chemical weapons". http://www.highbeam.com/doc/1P1-3987660.html. Retrieved 26 February 2016. ↑ "India to destroy chemical weapons stockpile by 2009". DominicanToday.com. http://www.dominicantoday.com/dr/world/2007/12/30/26543/India-to-destroy-chemical-weapons-stockpile-by-2009. Retrieved 2011-09-16. 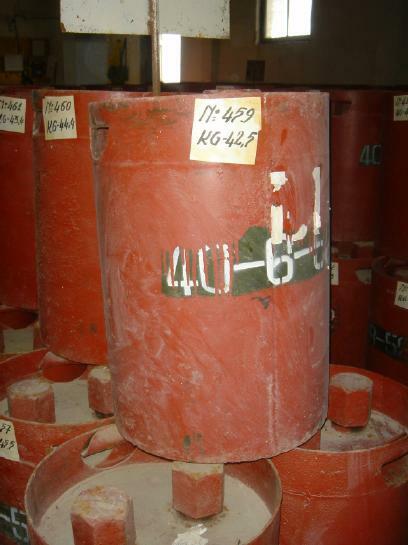 ↑ "India destroys its chemical weapons stockpile". Zeenews.india.com. 2009-05-14. http://zeenews.india.com/news/nation/india-destroys-its-chemical-weapons-stockpile_531700.html. Retrieved 2011-09-16. ↑ "Iraq Joins the Chemical Weapons Convention". Opcw.org. http://www.opcw.org/news/article/iraq-joins-the-chemical-weapons-convention. Retrieved 2011-09-16. ↑ "Abandoned Chemical Weapons (ACW) in China". Nti.org. Archived from the original on August 29, 2011. https://web.archive.org/20110829051632/http://www.nti.org:80/db/china/acwpos.htm. Retrieved 2011-09-16. ↑ "Ceremony Marks Start of Destruction of Chemical Weapons Abandoned by Japan in China". Opcw.org. http://www.opcw.org/news/article/ceremony-marks-start-of-destruction-of-chemical-weapons-abandoned-by-japan-in-china/. Retrieved 2011-09-16. ↑ "Canada Contributes to Russia’s Chemical Weapons Destruction Programme". Opcw.org. http://www.opcw.org/news/article/canada-contributes-to-russiarsquos-chemical-weapons-destruction-programme/. Retrieved 2011-09-16. ↑ "Research Library: Country Profiles: China Chemical". NTI. Archived from the original on June 5, 2011. https://web.archive.org/20110605083958/http://www.nti.org/e_research/profiles/Russia/Chemical/index.html. Retrieved 2011-09-16. ↑ "Russia destroys over 76 percent of its chemical weapons stockpile". http://rbth.ru/news/2013/08/22/russia_destroys_over_76_percent_of_its_chemical_weapons_stockpile_29136.html. ↑ Guarino, Douglas P.. "New U.S.-Russian Security Deal Greatly Scales Back Scope, Experts Say | Global Security Newswire". NTI. http://www.nti.org/gsn/article/new-us-russian-security-deal-greatly-scales-back-scope-experts-say/. Retrieved 2013-09-05. ↑ "Rocky Mountain Arsenal | Region 8 | US EPA". Epa.gov. http://www.epa.gov/region8/superfund/co/rkymtnarsenal/. Retrieved 2011-09-16. ↑ "Not with Impunity: Assessing US Policy for Retaliating to a Chemical or Biological Attack". Airpower.maxwell.af.mil. http://www.airpower.maxwell.af.mil/airchronicles/apj/apj03/spr03/conley.html. Retrieved 2011-09-16. Croddy, Eric (2001). "Chemical and Biological Warfare". Copernicus. ISBN 0-387-95076-1. Wikimedia Commons has media related to Category:Chemical warfare.